As Studio Two Three celebrates our almost-tenth year, I’ve been reflecting on my experience as the cofounder and Executive Director of Studio Two Three and lessons I’ve learned on the Art of Motherhood, the Art of Activism and the Art of Equity. We founded Studio Two Three nearly ten years ago - in fact, it will be ten years on August 25, 2019. I started it with three other women, Sarah, Tyler and Emily. We were just barely out of undergrad, having studied art - printmaking in particular. On top of that, once we left the university, there was literally nowhere for us to work in printmaking. It’s a field that requires a lot of large, expensive equipment and young artists are not known for their largesse or large homes. So, like any industrious and naive group of young artists, we decided to invent something from nothing - we’d just spent four years in constant making, so why stop now?! And that something we invented is Studio Two Three. Our mission is to give people the space, tools and education to find that thing they love and make it. We do this by providing studio space - communal and private - for over 120 artists. We also do this by providing affordable classes for community members at all levels of skill and all points in their lives. And we do this by partnering with other nonprofits to amplify the talent and voices of those in our community who deserve to be heard. So, Why Studio Two Three? It’s a question I get a lot. There are many answers. The most straightforward is: It was the number of our first studio door at Plant Zero, a rabbit warren of studio spaces in Manchester, of which we were number 23. It was a 400 square foot space with no running water, no windows, where we all split the monthly rent, borrowed printmaking equipment and used our earnings as servers and bartenders to keep the place stocked in ink, paper and very bad beer and wine for the monthly art openings we hosted. A second answer is that we needed a place to work - and so did so many others. We started in 400 square feet and in just one year our numbers had grown and we needed more space. I was in graduate school for nonprofit management and bartending to pay my way through. Alan, the bar owner, happened to know the building owner of a space i was looking at in an arts district on Main street, and that building owner just happened to be the high up in VCU’s School of the Arts, my alma mater. I gave Alan a “name drop list” - names of VCUarts staff and faculty who would vouch for us and the need for Studio Two Three, written in purple sharpie on a damp piece of paper from a yellow legal pad during a shift at the bar. I was expecting Alan to call the owner and read the list and sing my praises in a professional manner. Instead, he handed him the soggy list. Somehow, it worked. We moved to that 3,400 square foot building on Main Street in 2010 and began offering classes, gallery exhibits, field trips and community events in addition to our artist memberships. We started with 4 women in 400 square feet. Today, our 13,000 square foot Scott’s Addition studio is home to over 120 artists with 24/7 access, thousands of students each year, scores of vendors and craftspeople making a living through their art at our markets and community events. In less than 10 years we have come so far because of luck, miracles, stubbornness in the face of imminent failure, some very nice fire marshals, a constant love for what we do, curiosity and commitment to learning, an ever-evolving gaggle of interns, and the generosity of friends and family, and of acquaintances and strangers who, through that very generosity, have become friends and family. But back to the question: why Studio Two Three? I think that some of the scores of stories of the people’s whose lives our work impacts may be the best way of answering this question. “I first became a member at Studio Two Three when my work had reached a crossroads where I would need to give up on illustration entirely if I could not find an affordable space to expand. Studio Two Three provided me not only with a space where my small business could grow, but the type of community where I was able to come to the studio with my nine day old baby and was welcomed with a village of support and understanding. Accessibility is an under-discussed aspect of art, and Studio Two Three has created a community where ideas aren't restricted by their ability to sell, and creators aren't restricted by their situation - art, advocacy, and activism are given the freedom they need to thrive. Somehow, in 2019, motherhood and careers are still at odds. There’s an entire canon of writing and art-making on the balance (or impossibility of balancing) motherhood and artistic practice. This dichotomy need not exist. In her studio space, Clara is both a mother and an artist. She can feed a baby while while illustrating, rock a baby while packaging client orders, entertain a toddler with coloring while she works. She has space to live in that multitasking, graceful, harried, exhausted and exhilarated way of mothers. But let’s not kid ourselves. Clara is exhausted. So we hold the door for her when she comes in, wearing a newborn baby and carrying a Snugamonkey Rocker. We hold her baby if she needs a break. Just like we hold space for artists to be mothers and mothers to be artists. I love that she does that. “I sold my book proposal to Random House last summer and was given nine months to write and illustrate it. I took my first book check and did two things immediately; I hired my first babysitter and I paid for a year of private studio space at 23. I felt like a baller. Virginia Woolf said that a woman needs two things to write fiction, money and a room of one’s own. My book is a satirical feminist version of What To Expect When You’re Expecting, not fiction, but that’s what I needed too. We are currently in final edits for a book that I really think can change the world for women, and I could not have written it, if not for Studio Two Three. I worked whenever I could; sometimes surrounded by artists during the day, and sometimes my studio light was the only one on. in a big dark calm warehouse. Those are my favorite times, because I am a lone wolf, but in retrospect I am so glad that I had the option to come and work surrounded by other people doing their work, it sustained me when I got so tired and there was so much more work to do. BOOKS ARE LONG AND BABIES ARE A LOT and community has never been more important than it is now, for so many reasons. When I needed coffee, someone had usually already made it. When I needed to bounce my ideas off of someone different than me, all I needed to do was look around and pick one. Studio Two Three is a rainbow of artists, writers, community advocates, mothers, fathers, supporters, kids tromping through on field trips where they might learn for the first time that being creative can be a job and a way of life. In 2014, I was nine months pregnant with Max, our first child, and wearing a toga when we were shut down at our Main Street Studio by the fire marshals during a Burlesque fundraiser - oh-so-cleverly titled “Empire of Pleasure: A Night of Colossal Indulgence”. As it turned out, our building had no certificate of occupancy and hadn’t since the 1950s when it was a Coca Cola bottling plant. It most certainly was not zoned for an artist collective and occasional bawdy fundraising event. Remember that name drop list I used to get the building? Well, this time, I didn’t have a name drop list to share with the fire marshals. I did ask very slow and repetitive questions while people finished their beers, and thanked the nice fire marshals for waiting until the end of the event to shut us down so that we could make some money - a fact they shared with me as evidence that they were, in fact, very nice fire marshals. I spent all 6 weeks of maternity leave with Max learning a new name drop list, the ins and outs of zoning, parking variations, how to read architectural plans, and which employees at City Hall could help versus hurt the cause. 5 years later, I’m now on the Richmond 300 Advisory Council to update the citywide master plan, in no small part because of these hard lessons learned as a brand new mom, worried about a colicky newborn and terrified of losing all I’d worked for to the whims of bureaucracy. And in the end, after all that learning, we decided to move. We’d outgrown the space on Main Street in 4 years time and had to take a leap of faith. We had to ask for faith from those friends, family, strangers and acquaintances who had become family and friends. We had to build an even wider network, to ask more people to become family and friends and help us fund the renovations and relocation to a new home in Scott’s Addition. And with generosity, luck, tenacity and a lot of elbow grease, we did it. I wore Max in an Ergo Baby Carrier while on walkthroughs for the building renovation, breastfed him while inspecting finishes and electrical outlets, he cruised around the new Scott’s Addition studio in his baby walker before any furniture moved in. Now, at 4 years old, on days off from school he sprays down table tops and sometimes helps organize materials for workshops. More often than not, he helps un-organize materials. He is confident and proud of his mommy’s work - he tells people he’s going to be an artist just like his mommy when he grows up. In 2016 I became a mom for the second time, when I gave birth to baby Zoey, my magical little imp. We call her the house elf because she’s wee and full of mischief. I came back early from maternity leave, having to let a wayward employee go, and wore Zoey while righting the ship, preparing for our Winter Print Fair, hiring and training Hillary, our Assistant Director (who is amazing). The whole time, the house elf was with me, loved, held by interns, artists, visitors, and growing while surrounded by a village of support and the joy of making. My creative process now involves Max and Zoey. Max turns 5 next month, and he can make prints with mommy. We capture moments and trends in Max’s life - last year it was birds, we made the print Max’s birds together, evidence that Max and mommy were here, loved each other, and worked together. I made the print I Love You More (for Max), when my 2.5 year old came home and replied to “I love you” with “I luhhhh you mohhhh” - breaking my heart forever and making life so much richer. Somewhere in having children, the old you dies. You lose who you once were, most of it, at least. This loss of self is very real, but a new self takes its place. “But there is no self left. Why would there be? From one small body I made three new humans. I grew these complex beauties. I made their lungs and noses. It took everything I had to make them. Liver? Take it. Self-worth? It’s all yours. New people require natural resources and everyone knows you don’t get something for nothing. Why wouldn’t I be hollowed out? Who can’t understand this math? My latest print series is called “I Made These Complex Beauties.” My children, these complex beauties that I made, get to grow up in this magical space that I helped make. They are loved by a village of artists, they draw with wild abandon, they construct forts from Amazon delivery boxes and bits of string they found in a closet, they dance spastically to the Ramones in our event space on late nights while we prepare for our annual auction, they overindulge in the candy that is somehow ever-present on the table by the studio door. This is my Art of Motherhood and I wouldn’t have it any other way. But there are still more answers to the question: Why Studio Two Three? In January of 2017, in a climate of uncertainty and fear, we had dozens of requests for workshops to make t-shirts, posters, banners and other ephemera for the Women’s March in Washington DC. In the span of one week , over 500 people come to Studio Two Three to make artwork expressing their beliefs and advocating for policies they cared about. They went to DC wearing these shirts, and carrying posters and banners made at Studio Two Three. This underscores the power of print and the rich history of using printmaking. It is by far the the most democratic art medium with its ability to create multiples and disseminate information far and wide. Our community was making art to share ideas, express views, and advocate for social justice. The Art of Activism is an ongoing series at Studio Two Three because our community repeatedly asks for programs to help them express their First Amendment rights through artmaking. We work with mothers working to end gun violence, teachers advocating for better funding for our public schools, students running for Student Council, young people working to reform the juvenile justice system. The people attending those workshops were overwhelmingly white. We were supporting one version of feminism, one lens of advocacy, and we realized we had a lot of work to do. We still have a lot of work to do, but today we are consciously working on the Art of Equity. We regularly offer the studio space free of charge for other nonprofits and groups working for social justice in our city and state. We are intentionally collaborating with artists of color and prioritizing POC in our studio memberships. We are working to ensure that people of color are represented on our board, and in our staff, our membership, and our teachers. This is not to check off some “diversity checkbox” - its to make sure that the studio reflects our community and their needs. Richmond is diverse and artists and advocates aren’t one color, or gender, or orientation, or ability. By making sure the studio is a space that reflects the makeup of our community, we can send the message that this is a place where all are welcome, not just a place where white ladies can come to sew or make prints (although that, too, is true). “Studio Two Three is a huge reason artists at Milk River are seen as a vital part of the creative culture in Richmond. Milk River supports a neuro-diverse community of artists and fosters the exchange of learning between established and emerging artists with disabilities. We believe in creating space where everyone feels welcome and inspired to work with a wide-open heart, and sometimes our tiny studio just isn’t big enough! Making space for people, causes and actions that improve our community is a major priority for Studio Two Three. We just redesigned our 2014 Richmond map, which was a typographic design, because we realized we had left vast sections of the city - primarily black neighborhoods - off of the map. This was inadvertently racist, but the inadvertent part does not make the racist part any better. This sent a signal of who we thought was important and who wasn’t. The new map is almost ready - it’s geographically accurate and it includes every single neighborhood in the city of Richmond. We have many LGBTQ+ artists in our community and to make the space supportive and safe for them, we felt it important that restrooms be non-gendered. We collaborated with Side by Side, a Richmond nonprofit working with LGBTQ+ youth, to find the right language for our multi-stall bathroom signs. It may seem like a small thing, and is uncomfortable for some visitors, but we can use this as a teaching moment and, first and foremost, it gives priority to the safety and identity of our artist members. We also have single stall restrooms for those who feel too uncomfortable in the multi-stall versions, because we truly wish to be welcoming and inclusive to all. I want to be clear that the work we are doing and will continue to do to make Studio Two Three a more equitable organization doesn’t make us amazing, or outstanding, or any other superlative. It is not optional work, we have a responsibility as a 501c3 nonprofit organization to be responsive to our community and serve the broad public good. We still have work to do, and now that we know better, it is our duty to do better every day. Over 140 years ago, Captain Henry Martyn Robert wrote the first edition of what has come to be known as “Robert’s Rules of Order” (the Rules). The first edition was 176 pages and intended to be an easy guide for meeting-goers. The most recent edition, with 140 years of updates and additions, is over 698 pages. Robert’s Rules is quite useful for large governing bodies but unnecessarily cumbersome for boards of smaller organizations like Studio Two Three. Proper adherence to the Rules often requires a parliamentarian and use of the Rules can silence voices who haven’t read and memorized all 698 pages. Studio Two Three values the input of all of our board members. We believe board meetings should be a place of fruitful discussion where all voices are heard and discussion flows freely. There is no law requiring that nonprofit organizations use Robert’s Rules of Order. Likewise, our bylaws do not require use of the Rules. Our board has adopted a modified consensus model for board meetings. This enables everyone to contribute meaningfully, interact as normal human beings and make sure that no one’s voice is silenced. Someone presents an idea. It may be a formal proposal, but most of the time it's just an idea, not yet fully formed. The idea is passed around and the pros and cons are discussed. As a result of the discussion—the more input, the better—the idea is often modified. If a general agreement seems to be emerging (this is where good listening and facilitation skills are helpful), you can test for consensus by restating the latest version of the idea or proposal to see if everybody agrees. If anyone dissents, you return to the discussion to see if you can modify the idea further to make it acceptable to everyone. If the board is unable to create a compromise that will satisfy a dissenter, a majority vote may be called as a last resort. WANT TO BE PART OF AN ENGAGED TEAM THAT FURTHERS THE MISSION OF STUDIO TWO THREE? We are actively looking for a few engaged board members to join the Studio Two Three board this year. We ask you to give time, talent and treasure - share your time, your expertise and make a significant personal financial contribution to the studio. In exchange, we will connect you with a growing creative community, professional development opportunities that are gasp FUN - and the joy of making a real impact in our community. If this sounds like you, please send me an email at ashley@studiotwothree.org so we can talk more! If you’ve been to our studio for an event or a workshop, you may have noticed the signs outside our restrooms. They say simply “This bathroom has sinks and stalls.” They are non-gendered. We know that this can be uncomfortable for some visitors, and this is not our intention. Our first and primary priority is to respect the safety and identity of our LGBTQ+ artist members, interns, students, visitors, donors, volunteers and staff. We also have single stall restrooms for those who feel too uncomfortable in the multi-stall versions, because we truly wish to be welcoming and inclusive to all. However, the beautiful wallpaper inside the multi-stall restrooms is a pretty good reason to go inside. Sarah Rowland designed the paper and a very cool dude named Roger installed it. Sarah has spent many hours working at Studio Two Three, and is a real support of our artistic community, and a real-life artist success story! Her wallpaper is now being featured in magazines, homes and corporate contracts across the US! We had left vast sections of the city - primarily black neighborhoods - off of the map. We are offering anyone who owns the previous map a trade for the new version when it’s ready, early in April. We participated in Giving Tuesday for the very first time this year and were thrilled with the outcome. We’ve been on the fence in past years because there is SO MUCH cacophony on Giving Tuesday from so many very worthy and deserving organizations. We decided to give it a try - we put a goal of 10k out into the world and got pretty darned close for our rookie year! 103 Total people who donated; by far the most we've ever had in a day! We spent a few days preparing content for social media, newsletters, and personal emails to make our Giving Tuesday asks go as smoothly as possible. Staff, artist members, teachers, volunteers, and board members all shared personal emails with their networks, as well. We sent WAYYYYY more emails through our newsletter than we do on any other day. The risk, of course, is irritating people who are like “Please shut up about Giving Tuesday already!” We segmented the list as much as possible to make sure we didn’t re-email people who had already opened our previous emails. We did a little tote bag incentive giveaway which got people excited - everyone loves swag! My personal favorite part of the day was creating a Facebook fundraiser on my personal page. I’m not super active on Facebook generally, and on Giving Tuesday I was GLUED to my page. I selected a personalized GIF for everyone who donated and thanked them with a goofy little moving picture in response to their gift. GIFs for GIFTS, y’all! It made it really fun and personal and just the right amount of (completely) goofy. FOLLOW UP IS ALSO KEY! We personally called every single person who donated on Giving Tuesday to thank them. This of course took some time, but people loved the calls and it was a great opportunity to give thanks and connect more deeply with our community. We will participate in Giving Tuesday again in 2019 (hopefully this isn’t HORRIBLE news to anyone reading this who is totally over the Giving Tuesday thing). We loved connecting with people, having genuine interactions through phone calls and silly Facebook interactions, and it gave us a great platform to connect with new donors and share some of the many people and things that make Studio Two Three special. Fall Fun Times! November News You Can Use! At Studio Two Three, we are in the business of helping people find that thing they love and make it. We are in the business of connecting artists to communities, artists to each other, and people to their power to express themselves as makers, individuals, advocates and activists. We are in the business of changing lives. And we cannot do it without you. Please make a year-end gift now to support artists and amplify voices for positive change in our community. Explore the basics of Quickbooks online, as well as frequently asked questions about Quickbooks. Take your art biz to the next level. Register Now! Looking to start up your own t-shirt printing business? 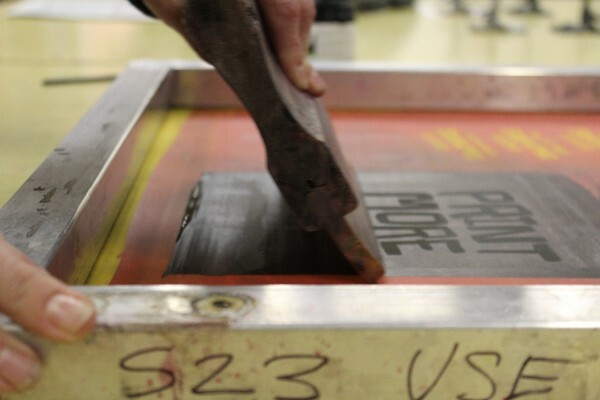 Interested in taking your screenprinting skills to the next level? Want to print sweet swag for your new band? Register Now! Transform copies of photographs, drawings, or other imagery into transparent layers within your art. Register Now! 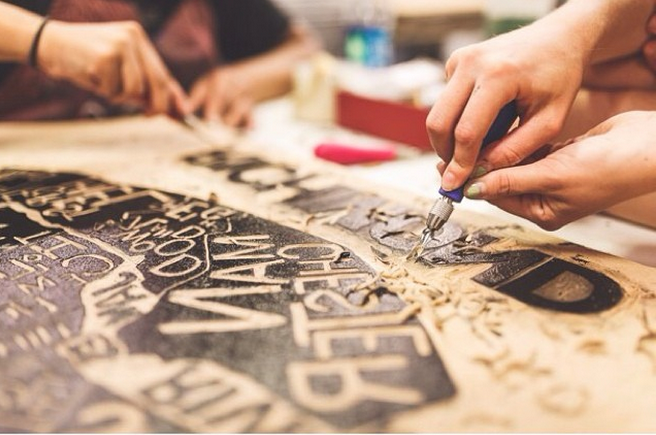 In this two-day class, students will learn and be introduced to Mokulito, an experimental form of wood lithography and carving. Register Now! Learn the traditional technique of marbling paper! Register Now! Explore the painterly process of monotype to create one-of-a-kind prints. This class will delve into techniques of mark making, painting, stencils, and ghost images using various water-based mediums. Register Now! Who says shibori is just an indigo thing? We'll break with tradition and use shibori techniques with some different hues to make textiles for your home or for you to sew. Register Now! Learn to traverse the line between analog and digital printmaking with a risograph printer. Participants will learn best practices for file preparation and output, use of a risograph printer, and printing and registration. Register Now! What’s the buzz about Strategic Planning? We’re going to be talking about the role that strategic planning plays in a nonprofit organization and why it is essential to your future. Learn the whys and how-tos of strategic planning make your organization better and stronger! SOJ Winter Market: We have special swag at the winter South of the James Market. Come see us Saturday, November 24! Small Business Saturday: Saturday, 11-24 at Studio Two Three event space! Local vendors, food and drinks, plus, a special Studio Two Three shop opening with new holiday goodies. 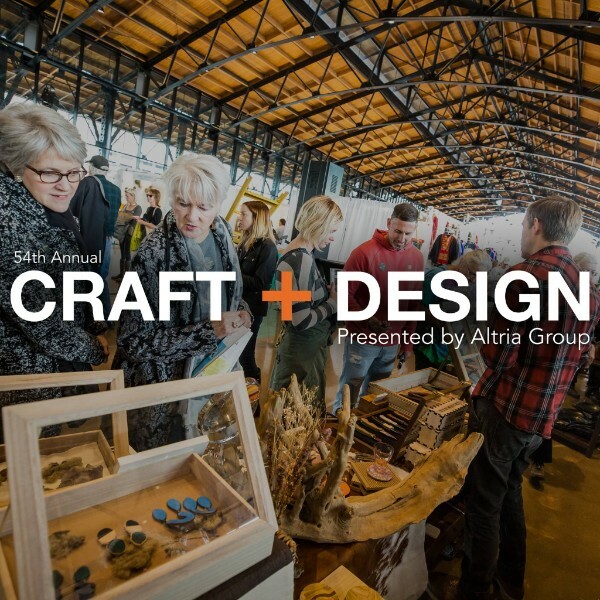 We are excited to be a Community Partner for the Visual Arts Center of Richmond's 54th annual Craft + Design exhibition! Over 150 artists showcasing their crafts! Nov. 16-19 at Main St. Station historic train shed. You can learn more and get tickets here! Make It Rain(bow) - a reminder why we do what we do and why it matters. Make it Rain(bow) - our first annual summer shindig, fundraiser, party to celebrate the stories of Studio Two Three - was a hit. But more than that, it was a reminder why we are here, why we do what we do, and why it matters. Studio Two Three provides a home for a creative community - a home that is made possible through gifts from generous individuals and grant funding from the Virginia Commission for the Arts and the National Endowment for the Arts. Free Egunfemi shared her story of founding Untold RVA and printing her first-ever t-shirts at Studio Two Three. Nikko Dennis shared his story of starting fashion brand Chilalay to his now full-time gig making and selling fashion. Sophie Treppendahl shared her story of moving to Richmond, finding a home at Studio Two Three, and actually quitting her day job to become a full time artist. Connie Shumaker - aka Connie Troversial - shared her story of finding a safe space, a family and artistic support as an intern turned member. 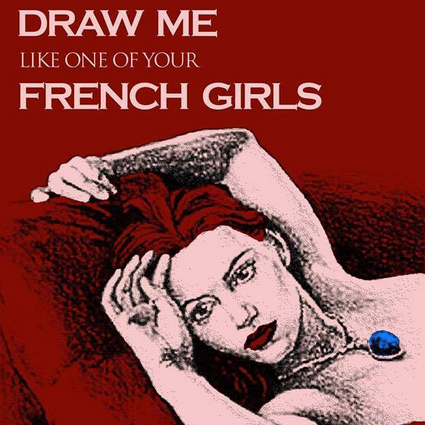 Before I became a mom, I was a writer, illustrator and storyteller in the New York Alt Comedy scene. I lived in a studio apartment in deeeeep Brooklyn where I grew up, not cool Brooklyn with fun stuff. It was basically me and the old Russian couples, and it was still EXPENSIVE, so I was well below the poverty line, but I had the space and time to do the work I was trying to do, so that worked for me then. One of the privileges of being born a white woman is that you’ve been taught to have a drive; and so you feel a little safer taking risks to make a career happen than if you were a woman of color. I just want to acknowledge that privilege here in front of a group of mostly white women; let’s feel our feelings in a safe space LOL. The acknowledgement of privilege and search for true equity is one of the things I love most about being a part of the Studio Two Three community and why I’m proud to call Ashley one of my best friends. I fled New York and most of my career and creative community when my daughter Rocket was 7 months old; nooo one helps you carry a giant stroller up the subway steps, and a life where we had to rent a car to drive to the good grocery store was not the life for me. It was at a time when all of my friends in New York were getting famous and landing TV pilot deals, and all of my friends in Richmond were having babies. So we moved and for a few years I pretended that I wasn’t an artist anymore, mostly out of necessity. This didn’t work and I got very cranky when I realized that the new life I had created left very little space for me. My husband and I are both cycle-breakers, and so we don’t have our families in our lives. We literally parent in a bubble. All of the time. I sold my book proposal to Random House last summer and was given nine months to write and illustrate it. My writing partner is the creator of Reductress.com (which is basically The Onion for women and if you don’t know it, please do yourself a favor and visit it because it will be the new light in your life). She’s also a mom, and her FT editor-in-chief job is unpaid; again, her privilege. That’s basically where we are at, as women. The privilege to be unpaid. ANYWAY She had full-time daycare already set up, and I had none, but now I had a deadline. I took my first book check and did two things immediately; I hired my first babysitter and I paid for a year of private studio space at 23. I felt like a baller. Virginia Woolf said that a woman needs two things to write fiction, money and a room of one’s own. My book is a satirical feminist version of What To Expect When You’re Expecting, not fiction, but that’s what I needed too. We are currently in final edits for a book that I really think can change the world for women, and I could not have written it, if not for Studio Two Three. My FORMER babysitter was part time, and not at all reliable. I worked whenever I could; sometimes surrounded by artists during the day, and sometimes my studio light was the only one on. in a big dark calm warehouse. Those are my favorite times, because I am a lone wolf, but in retrospect I am so glad that I had the option to come and work surrounded by other people doing their work, it sustained me when I got so tired and there was so much more work to do. BOOKS ARE LONG AND BABIES ARE A LOT and community has never been more important than it is now, for so many reasons. When I needed to draw a picture of a woman farting on her husband during childbirth class, I came downstairs and asked another studio resident if I could use his face as the reference. When I needed coffee, someone had usually already made it. When I needed to bounce my ideas off of someone different than me, all I needed to do was look around and pick one. Studio Two Three is a rainbow of artists, writers, community advocates, mothers, fathers, newly-graduated artists, people of color, supporters, kids tromping through on field trips where they might learn for the first time that being creative can be a job and a way of life. I certainly didn’t learn that at home; I learned it in an 8-hour figure drawing class I took on Sundays which I paid for with stolen money out of my mom’s purse. 23 is the closest thing I’ve got to a tribe, something we are sorely missing in this world. It’s a tribe supporting creativity in all people, supporting empowerment and equity for the oppressed, elevating the voices of those who deserve to be heard and have their work seen and have space left for them and it has GENDERLESS bathrooms; this radical and inclusive detail is a great indicator of the human rights focus at the forefront of everything Studio Two Three does. The truth is you’re just another group of kids tromping through on a field trip, so If you’re creative already, if you’ve always wanted to be, if you feel like your life doesn’t leave enough space for you to even decide what you’d most like to create, or if you’re just looking to be a part of an exciting and positive organization that’s doing all of these things for people in your community; there’s space for you here. 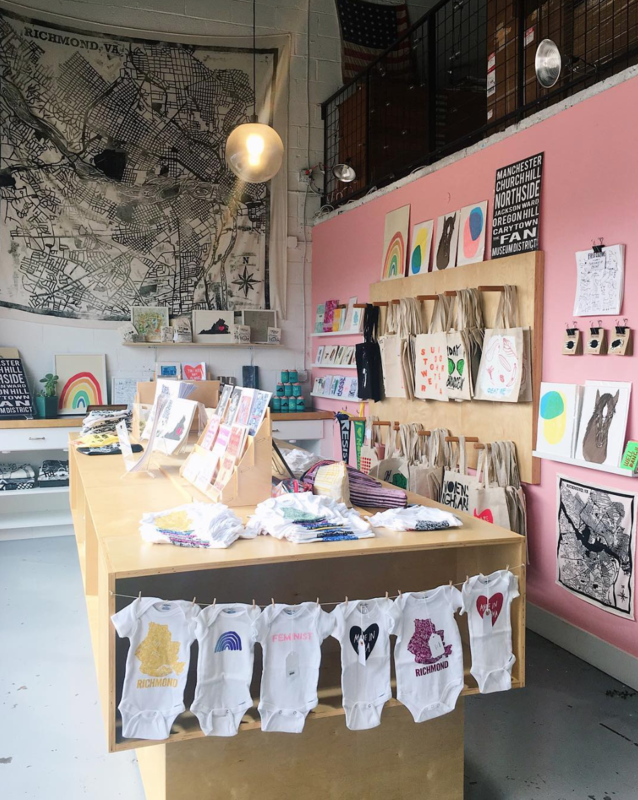 On Mother's Day weekend, 50 vendors hawked their wares at Studio Two Flea for mom's, pet moms, people who weren't moms at all. DJ Rattan spun tunes, Milk River Arts raised funds with a bake sale, tarot fortunes were read, guests commissioned cyanotypes portraits of Fido and FiFi, a grand time was had by all! Stay tuned for A Late Summer Night's Flea - August 26th! An evening market with twinkle lights, music, local art and vintage wares under the light of the summer moon. A cyanotype portrait of Fido! 6 lady DJs cranked out their darkest tunes at Goth Spring, a fundraising dance party benefitting Studio Two Three. They came, they danced, they wore lots of eye makeup. They connected with their dark side while supporting Richmond's nonprofit art studio. BURNING BOTH ENDS AT STUDIO TWO THREE! A (DARE-WE-SAY?) FUN BUSINESS CONFERENCE! We hosted Burn Both Ends on May 4 and spent a day learning from small business owners, creative entrepreneurs, and having a daggone good time. It was great to see how our new event space can cater to a conference and even better to meet a hundred local movers and shakers learning how to improve their business hustle! Studio Two Three Board Chair and marketing maverick Leah Muhlenfeld giving her keynote - storytelling, marketing and love! As friends and frequent collaborators, the teams at The Content Chop Shop and Campfire & Co. combined their powers to develop educational and networking events that give young businesses the tools to grow. After a successful series of workshops in both Richmond and Norfolk, the trio of designers and marketers realized the need for more in-depth events that catered to a new generation of businesses. The Burn Both Ends all-day conference event was born. Henrico High School commissioned artist (and S23 teacher) Brooke Inman to work with students to develop iconography representing the entire student population and their paths around the high school campus. The students chose shoes as representation for groups of students - upperclassmen, lowerclassmen, art students, math lovers, etc. Once the plan was developed and data gathered, S23 To-Go spent the week at Henrico High printing the iconography to represent every student at the school WITH EVERY STUDENT AT THE SCHOOL! Students were busy printing, cutting shoes, and planning the final product. What’s that, you ask?! An 8’x28’ wheat pasted mural of the iconography to be installed in the Commons of Henrico High! You can swing by Studio Two Three Monday, June 3 between 11am and 5 pm to watch the wheat pasting in action - we will be working with teachers and the students on the Mural Committee to make this big awesome dream a reality! Support for Studio Two Three programming is provided by the Virginia Commission for the Arts, the National Endowment for the Arts and generous individuals. Printing sunny yellow in the sun! When printing becomes a sport! Not gonna lie, it's hot. A bucket of ice helped! This spring, we had the pleasure of collaborating with Free Egunfemi and Kelley Libby on Healthy, Wealthy + Wise, a project in public history, public art, and public media. The project was funded by Richmond Memorial Health Foundation's Health Equity Arts grants program. There is an exhibit at VCU's The Depot, 814 West Broad Street. The exhibit displays the work of all of RMHF's HEArts grantees, and is open to the public until July 22, 2018. A short film on the Health Equity Arts Program. Equity tops the list of RMHF’s values, but few people have a clear understanding of its meaning and importance. The word “health” generates an immediate mental image – perhaps a doctor with a stethoscope or a family growing a vegetable garden. But most people struggle to envision the word “equity.” In essence, public perception of this concept is a blank canvas. To fill that canvas, RMHF invited six local artists and artist collectives to create works of art that communicate the concept of equity and its significance to residents of the Richmond Region. The goal is to inspire and motivate change that embraces equity by tapping into the many forms of creative expression that are alive and thriving in the Richmond Region. Through the Health Equity Arts, or HEArts, program, artists and artist collectives will receive an award of $10,000 to support their individual projects. They will also participate in periodic discussions to share their insights and progress with each other and Foundation staff. Their completed works will be exhibited at RMHF’s offices and other locations in the region. We had the distinct pleasure of hosting Richmond Women in Design for a visit and tour of Studio Two Three on May 22. These talented (and brave) women came to the studio on a walking tour despite a torrential downpour that was literally flooding the streets of Scott's Addition. Luckily, the studio had brand new rags (unused t-shirt scraps), some newly-washed towels (normally used for blotting etching paper dry for printing) and a roof to keep out the rain. I had the great pleasure of hearing about their professional pursuits, brainstorming potential collaborations, and discussing memberships with these creative humans. What fun! Put on your walking shoes! Richmond Women in Design is hosting a Craft Studio Walking Tour in Richmond’s fastest growing neighborhood, Scott’s Addition. The event will start promptly at 5:30pm, so be sure to find on-street parking in advance. Afterwards, please join us at Väsen Brewing Company for a social hour, with a first-come-first-serve starter bar tab on RWiD! Total walking tour distance: 0.6 mile. See flyer for map of tour. PHOENIX HANDCRAFT is a husband-and-wife team. Kyle Lucia is a furniture designer and traditionally-trained blacksmith. Johannah Willsey is a visual artist specializing in mosaic. Together they create modern designs in metal, mosaic, and wood with the timeless feel of handmade work. STUDIO TWO THREE is a nonprofit organization, where Richmond is making its creative community, telling its stories, and building its future. Studio Two Three’s mission is to give people the space, tools and classes they need to find that thing they love and make it. I just had the pleasure of writing a LookSEE review of Emmy Bright's show at Quirk Gallery. Each day, I am surrounded by artists and art makers. I love art and collect it myself. I give my two cents (wanted or not) on art in progress every day. However, writing about an art exhibition is not something I do often. At Studio Two Three, we are in the business of helping people find that thing they love and make it. We are in the business of connecting artists to communities, artists to each other, people to their passion and to their power to express themselves as makers, individuals, advocates and activists. We are in the nonprofit business of serving the public trust and making sure that our funds, our activities and our programs make our community, our city, and our world a better place every single day. This business - and the corresponding responsibility and trust - is the very reason Studio Two Three exists. It is this business that makes my heart full. Because of this business - and the existence of Studio Two Three - I get to work with/alongside/in awe of people like Emmy Bright. The LookSEE review was an attempt to capture the impact of Emmy's work. This post is an attempt to capture the magic of working alongside someone who has found that thing they love and is making it - and helping others do the same. It's an attempt to show just how very important artists and creatives are. Emmy is the person who walks into a room - or a 13,000 square foot studio - and lights it up with her energy, production, spirit and love. Emmy is the person who fills print racks with new work and others with new drive. She is the person you try gamely to convince to "just stay here, Richmond needs you!" while knowing that she has much work to do in Detroit and that once you've connected, that connection will always be. Emmy is the person who mails Studio Two Three a sweet note in January packaged with gummy bears from Detroit (really really good gummy bears). And those gummy bears are wrapped in a misprint as packaging. A misprint that you diligently un-crumple, flatten out and hang up so that you can can bask in the joy and angst and brilliance that is Emmy Bright. Emmy is the person whose slightly-belated Valentine card arrives in the midst of planning anti gun violence workshops with bereaved high school students, Moms Demand Action, and Richmond Teachers for Social Justice. A well-timed reminder that in making things with our hands and saying things with our voices, we are change agents/art makers using what we have to do everything in our power to make a better world. Emmy has found that thing she loves and is making it - and inspiring so many others to do the same. On the morning of Friday, Nov. 17, we hosted Creative Mornings RVA, a monthly event attended by Richmonders who gather for creative inspiration, in our new Other Side space. More than 200 attended (tickets, which are free, were snatched up in an hour!) and were treated to a heartfelt talk by featured speaker Ashley Hawkins, our executive director. With the month's theme of "Death" in mind, Ashley began with a story about her beloved aunt who sparked her love of fun, style and creativity and who died way too young. Her spirit has lived on in all of Ashley's pursuits including what she calls her "ultimate creative expression," Studio Two Three. Ashley talked about the importance of choosing the creative life and her love of passing it on to her two children, Max and Zoey. When you're a small nonprofit, it can be challenging to access help from marketing professionals. So, when Altria's brand management group called for applications a few months ago for their annual CreateAthon, we quickly applied. A CreateAthon is a 24-hour pro bono marketing marathon during which professionals and/or students develop marketing strategies and creative materials that can help nonprofit organizations meet specific marketing objectives and increase their overall marketing capacity. Studio Two Three was one of several Richmond non-profits selected to be the focus of Altria's CreateAthon teams, and today they shared recommendations and ideas with us following their 24-hour creative marathon. They focused on ways to increase awareness of our classes and events through our website, printed materials, social media and email as well. We met with our CreateAthon team, headed by Rachel Nichols, at Altria and here at the studio, and on Nov. 8 we attended the reveal of what they came up with for us to consider in their 24-hour work session. They walked us through their strategies and recommendations for both print and digital marketing media, answering questions and explaining their thoughts. "We loved so many of their ideas and have already implemented quite a few," says Ashley Hawkins, Studio Two Three executive director. 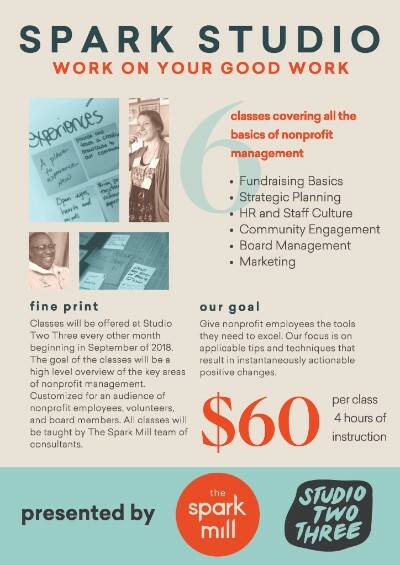 "They helped us with our tag line, web site organization, class promotion ideas, event possibilities and more, all designed to raise community awareness about Studio Two Three." Many thanks to our Altria team, a great group who took an enthusiastic interest in what we do and worked hard to come up with a plan for us. Executive Director Ashley Hawkins named to Richmond 300 Advisory Council. Richmond 300: A Guide for Growth, is the update to the citywide Master Plan. The city received over 150 applications for the 15-member group, which was then expanded to 21 members. The fact that so many people applied to serve on the Council is very exciting as it shows that the Richmond community is ready and willing to be part of this important process. "It was not easy to select the group out of a pool of over 150 well-qualified applicants, but we have assembled a group of 21 Richmonders who come from diverse backgrounds and bring knowledge in various areas of expertise." The Advisory Council members are: Rodney Poole (Chair), Max Hepp-Buchanan (Vice-Chair), Burt Pinnock (Vice-Chair), Jonathan Bibbs, Cyane Crump, LaToya Gray, Bernard Harkless, Ashley Hawkins, Elyana Javaheri, Joyce Knight, Preston Lloyd, Louise Lockett, Monica Lozano, Jer-Mykeal McCoy, Jennifer Mullen, Kendra Norrell, Cailtlin O’Dwyer, Damian Pitt, Ted Ukrop, Meredith Weiss, and Olivya Wilson.